Walking around the drone pavilion at NAB this year, it was surprising to see the advances equipment and software organizations have made for filmmakers in just a few short years. 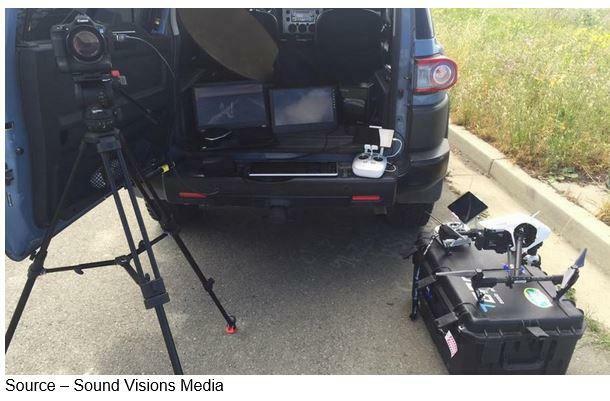 New flying platforms, camera controls and stabilizing systems as well as affordable, lightweight, high-performance cameras have really given a lift to film production and especially news coverage. 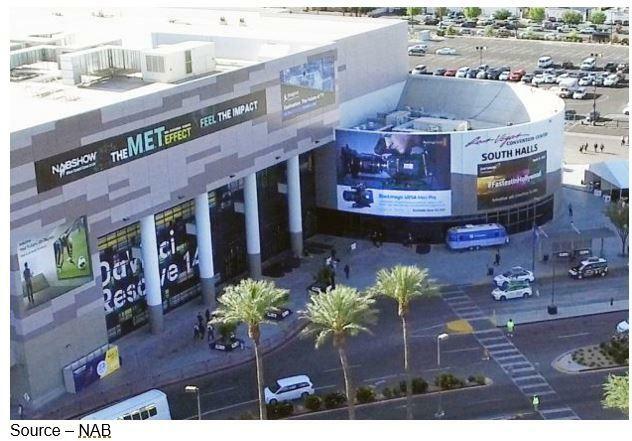 Aerial View – When NAB opened this year, nothing could be more natural than an aerial shot of the South Hall. It seems as though every news organization around the globe has several trained drone pilots and camera operators. Over the past six months, news programs increasingly cover Bay Area road wash outs, power outages and emergency personnel rescues. I have nothing against the CTA (Consumer Technology Association) encouraging the sale of hobbyist drones. After all, it’s good for their CES show and segments of the industry. According to their research, sales grew more than 60 percent last year to 2.4M units. 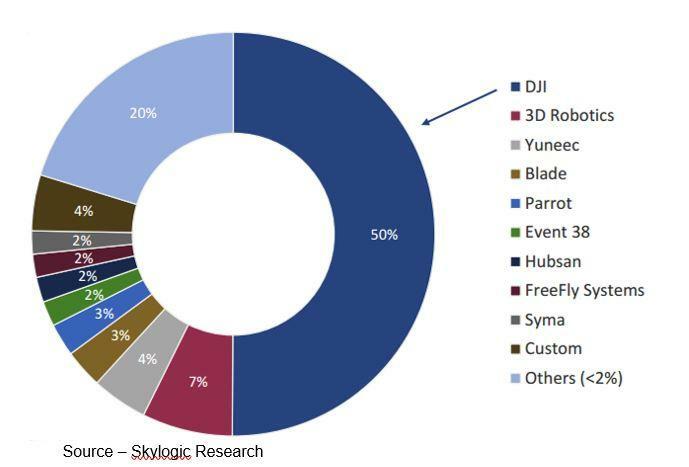 Leader – DJI is clearly the leading global mid-range drone manufacturer in the $1,000-$5,000 price category. The firm is constantly adding features and capabilities that seem tailor-made for today’s filmmaker. Of course, most of those are mere toys – 250 grams, while “real” drones are bigger, more feature-rich and designed to really do important, valuable stuff. Still, the father who buys his kid a drone so dad can fly it and show off causes problems for people who want to make their living capturing great images. 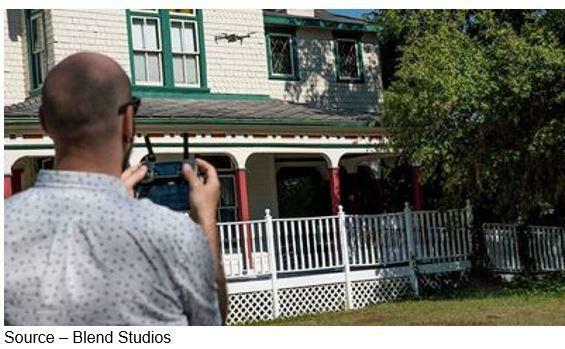 It has been roughly two years since the FAA (Federal Aviation Administration) began authorizing the use of drones for the film and television industry; and they’re becoming great tools for directors and filmmakers. Prior to this time, breathtaking aerial film work like Skyfall’s opening scene rooftop motorcycle segment and the cycle race in Mission Impossible: Rogue Nation were done outside the U.S. Dramatic Scenes – Motorcycle race scenes like the one above in Mission Impossible: Rogue Nation would have been difficult, dangerous and expensive before today’s high-performance drones and economic, light cameras. Today, the sky is the limit for independent filmmakers. Today, filmmakers can get some great scenes skimming through alleys, flying over canyons, showing landslides/roads washed out, giving an elevated view of a person running through the forest, warehouse chases and even flying through doors and windows. Michael Chambliss, International Cinematographers Guild representative, notes that drone filmwork is quicker, faster, easier and cheaper than crane or helicopter shots. “If something goes wrong, all you need is a broom and a garbage bag,” he said. “The impact – even to your budget – is minor." Filmwork like this and more relaxed regulations, have sparked a lot of interest with shooters and it was very evident in the drone pavilion, especially in DJI’s booth, clearly the most dominant player in the industry. 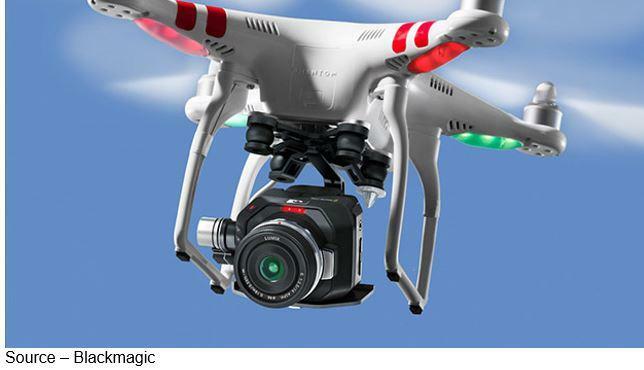 Easily Recognized – The DJI Phantom has become an easily recognized symbol of the drone industry and a cost-effective favorite for a lot of independent filmmakers. Shown with Blackmagic’s Micro Cinema camera, it has become an aerial rig within the financial reach of nearly everyone. While the distinctive style of the DJI phantom has become perhaps one of the most recognizable forms of a personal drone the company has one of the broadest range of rigs for filmmakers you’ll find. The Chinese firm has 50 percent of the market for drones selling for more than $500 (below that they’re mere toys). It has 66 percent in the $1,000-$2,000 category and 67 percent in the $2,000-$4,000 category. Steady Shoots – While it was designed to enable steadier shooting in the air, DJI’s new Ronin gimbal is also a great answer for ground-level shooting. 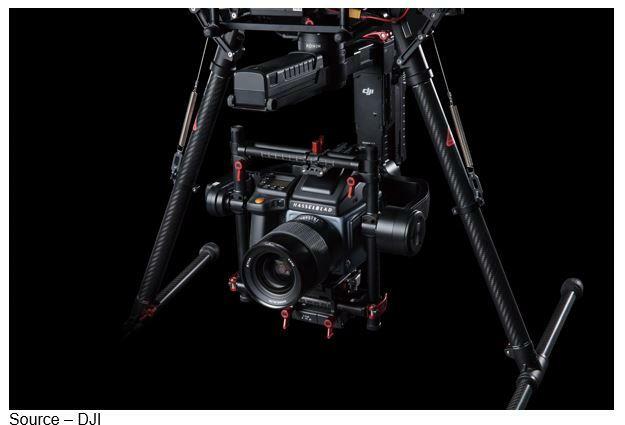 At NAB, DJI maintained its film/TV industry leadership with the new Matice 600 that can carry pro cameras like ARRI, RED, Blackmagic and others. A Haaselblad camera was also announced. What was really neat was the introduction of the new Ronin-MX aerial-compatible gimbal and the advanced intelligent flight modes – follow me, waypoints, point of interest – which make flying and filming a lot easier (two people are still required/recommended). 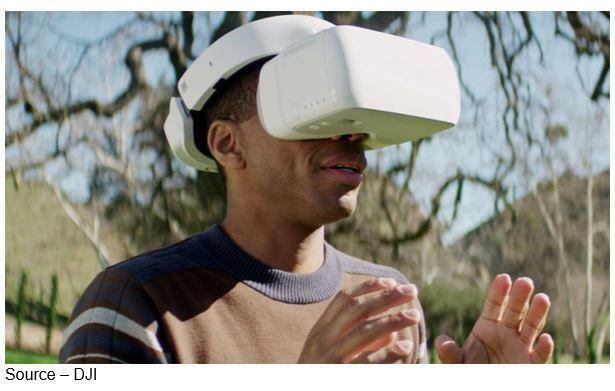 Camera Experience – With DJI’s new first-person view headsets, filmmakers can see exactly what the camera sees and can even control the movement of the drone in flight. An Airbus captain for United Airlines, he is also an FAA check airman, drone flight instructor and two-time Emmy award-winning filmmaker. In addition, he regularly conducts filmmaking workshops around the Americas and does drone film work for studios and advertising/marketing firms. “With a modest investment of $2,000-$3,000 for a good drone and camera, combined with a few days of practical training and practice, any good filmmaker can add depth and dimension to his or her work and they can do it safely,” he noted. In the drone pavilion, Jeff Foster, of Sound Visions Media; and Kerry Garrison, of Multicopter Warehouse, both agreed that while drones are increasingly easy to fly and shoot with, it’s important to have two people on any shoot – one to handle the drone and the other the camera. 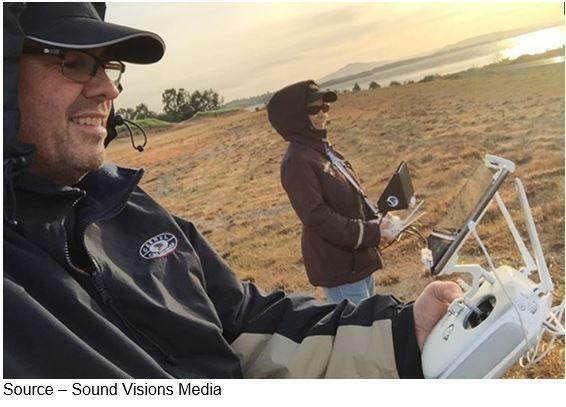 Takes Two – Jeff Foster (l), of Sound Visions Media, focuses all of his attention on shooting the scene while his pilot monitors the drone’s flight to avoid potential hazards. He noted that the novelty of aerial drone photography/videography is leveling-off to the point where it can be considered part of a commercial producer's toolkit. His aerial work includes a long-term documentary on the Marin County, CA Mill Valley Watershed, a unique drilling promotional reel shot in downtown San Francisco and interior/external aerial promotional films for Bio-Rad Laboratories. For most of his projects, Foster uses small drones; and for larger projects, he works with a network of aerial cine people. “The average shooter doesn’t need to keep $20,000 worth of UAS/cine gear for the majority of projects,” he noted. Quick Review – Foster downloads all of his RAW footage to OWC storage units immediately after a flight for safe storage but then also does a very quick rough cut to ensure he captured the scenes he wanted. Sending the drone back up for a reshoot is quick and easy…much easier than coming back and trying to duplicate all of the variables. While checking out some of the AI (augmented intelligence) features DJI has designed in to enrich and simplify the aerial filmwork, I struck up a conversation with Brian Mir, creative director at Blend Studios. He noted that drones have enabled aerial production to not only be more efficient but also affordable. “I was in NYC on a shoot last month,” he explained. 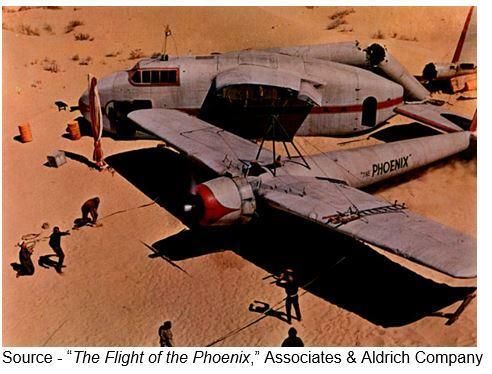 “Was getting the aerial shots that I needed, landed, packed up and gone in 15-minutes. “That saves time, saves money,” he emphasized. He noted that Blend does a wide range of projects with only a small percentage needing aerial footage, but it is increasing. Shooting both docu-style and full productions, their work ranges from GE Medical and Kohler to musical artists such as Sara Bareilles, Brantley Gilbert and comedienne Margaret Cho. Proud of the Emmy Blend won for the Potawatomi Casino, Mir said his latest project didn’t need a drone to shoot but was a “kick to do.” He explained that they just completed a four-part web series showcasing Sara Barielles taking the lead role in the Broadway musical Waitress. Practice – No matter how often he uses his drone filmmaking system he is always looking to improve his techniques so he practices in his spare time. He feels the more you use all of the equipment and test it/yourself you only improve the quality, depth and breadth of the visual story. Regarding aerial filmmaking, Mir said he thought the new AI features and advances in operation are great for shooters because they can focus on the segment but they also have their negative. Mir explained his drone can fly 1800 feet in the air but the FAA limits its flight to 400 feet, which is all the height you need for 99.9 percent of the film shoots. Foster and Mir both said that the industry is only slowly beginning to take full advantage of drone filmmaking because people still think in terms of cranes and helicopters…both time-consuming and expensive. As an airline pilot, Scott Strimple is a little concerned about the FAA eliminating the need for non-commercial drones to be registered. He notes that incidents will occur and they will impact what professional filmmakers do.